1Plant Physiology and Pharmacognosy Research Laboratory, Department of Botany, University of North Bengal, Rajarammohanpur, Siliguri, West Bengal, INDIA. 2Department of Botany, Maulana Azad College, 8, Rafi Ahmed Kidwai Rd, Taltala, Kolkata, West Bengal-700013, INDIA. 3Himalayan International Residential School, Rajganj, Jalpaiguri, West Bengal, INDIA. Introduction: Dysmenorrhea is a sort of painful menstrual disorder. Several plants like Allium sativum L., Areca catechu L., Zingiber officinale Roscoe, Crinum amoenum Ker Gawl. Ex Roxb, Cuscuta reflexa Roxb. Nymphaea rubra Roxb. Ex Andrews, Piper nigrum L., Citrus limon (L.) Osbeck were used in appropriate ratio to make herbal formulation to cure dysmenorrheal pain by the traditional healers of Rajbanshi community. Objective: By semi-structured questionnaires in the course of scheduled interviews with the local herbal practitioners, four herbal formulations (coded as DYS1, DYS2, DYS3 and DYS4) were recorded. 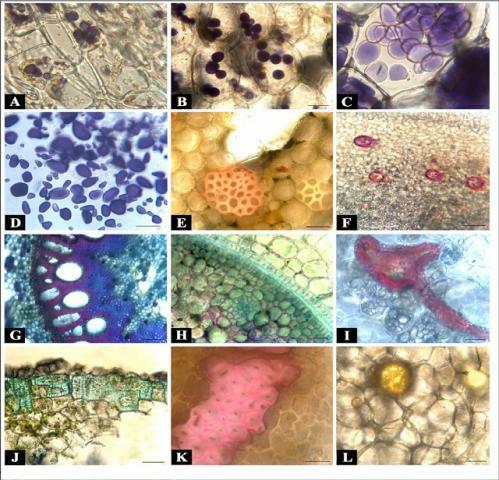 Pharmacognostic characterization was carried out for the authentication of the powder drugs which includes powder microscopy, fluorescence analysis and physicochemical evaluation. The presence of any therapeutic potential in DYS1, DYS2, DYS3 and DYS4 was determined by qualitative evaluation of phytochemicals of various successive solvent extracts based on their polarity. Thin layer chromatography was performed for screening various phyto-active compounds like arbutin, alkaloids, coumarins, cardiac glycoside, etc. Results: Powder microscopy revealed the presence of calcium oxalate crystal, stone cells etc. Various fluorescence colors were exhibited by these herbal drugs under UV after reacting with chemical reagents. Physical analyses values were also obtained in a satisfactory way. TLC and qualitative phytochemical analysis showed the presence of active phytoconstituents like arbutin, alkaloids, coumarins, cardiac glycoside etc. Conclusion: The results support the use of plants as a traditional medicine for the prevention disorders like Dysmenorrhea. Further evaluation is required for determining the efficacy of those herbal drugs and the active phytoconstituents involved in Dysmenorrheal therapy. Roy P, Mandal P, Panda S, Roy SM, Subba A. Pharmacognosy and Phytochemical Screening of some Plant Derived Medicine to Treat Dysmenorrheal Pain by the Rajbanshi Community. Pharmacognosy Journal. 2018;10(4):738-746.